‘Blossoms were barely evident on the gnarly trees as we dropped down the hill into Cortijada Los Gázquez. Springtime was upon us in late February, quite normal for southern Spain, but it hadn’t quite fluffed out the trees at this altitude of the Sierra Maria. This is almond growing territory, an adaptable crop for the dry limestone soil. 14 k of clay packed road through national forest brought us up to a whitewashed Cortijada, 5 houses in one, with a roofline of traditional half-moon terracotta pipe tiles piled one over the other. Smoke billowed from the chimney. I knew it would be warm inside, but I couldn’t imagine what it would be like living totally off the grid. A wind turbine became a familiar whooshing sound and the photovoltaic solar panels moved like a sunflower with the sun. I have lived without electricity before, using candlelight and lanterns, but this would be the first time living in a place that generates its own juice. Cortijada Los Gázquez sits calmly in the open on 50 acres, commanding the surrounding wilderness with quiet renown. 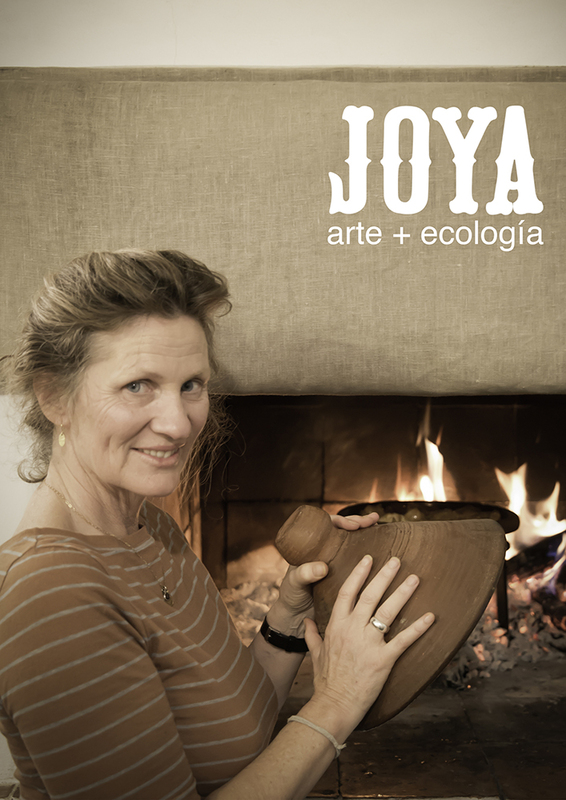 After four months of dreaming about it, I had at last arrived at Joya: arte + ecología, an ecological retreat for artists in the wilds of Andalucía. I settled into my room with warm radiant heat under my feet and opened my window to get a scent and a sense of my view. I can see the movement of the landscape and how it undulates with feminine earth curves the colour of fair skin. Lines of almond trees edge the fields and hillside terraces giving it friendly definition. I look forward to waking up each morning to watch for the almost inevitable slow motion explosion of frilly pink blossoms on the branches. I can’t imagine a more perfect place for writing. I crafted a business in 1992 called Culinary Adventures, which began in Tuscany cooking with local chefs and food artisans. I loved it; the travel suited me so I stretched it to other regions in Italy, Sicily, Spain, Morocco and India. After 25 years of handholding every trip, I was dripping with images and wanted to start writing about the extraordinary people that I have met along the way, especially the hidden artisans. I write my own website and newsletter content and the occasional magazine article, but I hadn’t stopped long enough to go deeper. Every time I tried to write a proper proposal, it lacked depth. A cookbook would only skim the cream off the top. I wanted to go as deep as possible. Memoir, I realized, would require a full stop and a deeper dive. I needed time to contemplate and digest my memories. I began writing short stories about the characters I have met and needed time to develop them and to refine my voice. I applied to Joya and was accepted to my first residency for writers. These last 10 days have been merciful. I had just arrived from the bustle of India and this was the perfect antidote. Dropping into the warm, forgiving, atmosphere has been a balm. It takes time for the world to stop spinning and when it does, there is a noticeable lightness of being, as if someone has opened a door and let the long lost light and fresh air circulate. Even breathing is easier. I found the time that I needed to edit working stories and slowly, I started to recognise my own voice. We have to get really quiet to hear it, as if it doesn’t really want to talk. Some experiences are hard to articulate, because they do not exist in the realm of words. This was the most surprising discovery. The voice that I have been listening for is practically inaudible. I found it. It’s there, awake, intelligent and knowing, but so far it prefers to be silent. I accept this like a secret offering. I will have to get quieter to get to know her. She may be saying, “find a way to interpret my language”. This is what the trees said to the Navajos. When I first arrived there were a handful of other artists here. I was overwhelmed at first at how fortunate I felt to be in the company of young people who have chosen to delve into the practice of fine art. I climbed the nearby sunrise mountain with three artists from three different countries; Norway, Canada and the UK. Long Gao had collected found objects like glass shards and wanted to make an installation on the top of the mountain in the shape of a griffin vulture shadow. It was intriguing enough to get me all the way up to the top, stretching my body and physical boundaries more that I thought I could, but I did it. I considered it a metaphor for what I wanted to do with my writing. Go beyond self-imposed boundaries. Along the way, we had lessons in natural navigation from the primo expert in the world, Tristan Gooley, who was here to contemplate his next moves. Marie Skeie shared her big view of the relationship between ecology and politics. I was exhilarated. Filmmaker Hanley Zheng tutored me in film editing. My perspective blew open and for the first time in a long time, I could see out of my box. It was like there was a certain yeast in the air, to use a food analogy. Bakers build up a yeasty environment that bread responds to. Cured meats, cheeses, wine, anything that’s fermented needs the air to be thick as thieves with supportive enzymes. This is what Joya felt like to me, an environment rich in invisible creative muses. Evenings were delightful with owners, Simon and Donna. They have built this place as a labour of love. Both are brilliant artists themselves with a down to earth mix of wit and English sensibility. We didn’t lack for anything and feasted practically every night on Donna’s delicious food and stimulating conversations. Presentations of artists work were given nightly. Simon kept things lively at the table and gave spot on feedback of constructive support. The table has a way of bringing everyone together. It’s a platform. All you have to do is show up to be fed in so many ways. You get to know each other, which relaxes any creative process. Warmth in every way loosens the grip of rigidity. We had become a community in just a few short days. I’m convinced it had to do with being held so beautifully in this intentional, off the grid container called Joya. I came to the well and I took a deep drink. Yet, I’m thirsty for more. The muse is in the AIR’.